The notoriously enigmatic Krisnan Inu produced some inspired pieces of play and several horrifying mistakes in the 2011 grand final, ultimately finishing on the debit side of the ledger in the Warriors’ 24-10 loss to Manly. He made a stunning 40-metre break from a kick return in the second half but lost the ball at the end of it, before making a meal of a grubber to the Warriors’ in-goal two minutes later which went within millimetres of gifting the Sea Eagles a try. Inu’s mixed bag contained a total of three handling errors for a Warriors side that was desperately searching for continuity and momentum. 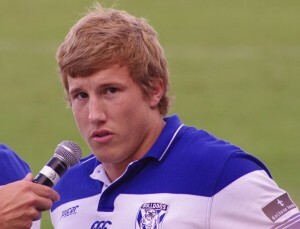 A year later, Inu became the second player in history (after Phil Sigsworth) to lose grand finals with three different clubs after featuring in Canterbury’s loss to Melbourne. The Bulldogs’ chances of pulling off a grand final upset against overwhelming favourites Souths were hamstrung by halfback general Trent Hodkinson’s anonymous display in the 30-6 loss. Carrying an injury into the decider, the incumbent NSW No.7 was virtually a passenger, handing the kicking duties on to less-credentialed halves partner Josh Reynolds and failing to create any opportunities for the gritty blue-and-whites. Thursday Islander Kevin Yow Yeh, who ventured to Sydney with Redcliffe teammate Arthur Beetson in ’66, was a brilliant but erratic three-quarter talent. Unfortunately, it was the latter quality that shone through in that season’s grand final, with a slew of handling errors by the Balmain centre contributing to a convincing 23-4 loss to St George. It was hard to fault the overall effort and performance of the Canterbury side in its 2012 grand final loss, with the clinical excellence of Melbourne forming the basis of a hard-fought 14-4 result. But winger Jonathan Wright was one Bulldog who had a particularly unhappy afternoon, making four handling errors in a horrendous display that saw him lumped with the lowest score in virtually every post-match player ratings list. Rocks-or-diamonds fullback Scott Wilson’s display in the ’94 grand final against Canberra epitomised the Bulldogs’ disastrous afternoon. He was far from the only sub-par performer in Canterbury’s 36-12 loss, but he spilled three bombs, was left grasping at air after being easily stepped by Raiders winger Ken Nagas who raced away to score, and was unable to stop Laurie Daley’s 40-metre run to the corner for another Canberra touchdown. Wilson was hooked after 32 minutes and replaced by Matthew Ryan. Parramatta winger Neville Glover was responsible for the most infamous handling error in grand final history (although that dubious honour now possibly belongs to Ben Hunt), putting down a regulation pass from his centre John Moran with the try-line wide open and the Eels down by one point during the second half. Although there was plenty of time remaining and it is unfair to blame Parramatta’s 13-10 loss to Manly solely on Glover, he did let another pass from Ed Sulkowicz slip through his fingers while the Eels were hot on attack inside the final 10 minutes. Glover represented Australia against New Zealand two years later and scored two tries on Test debut, but his name will forever be associated with his unfortunate fumble at the SCG. One of the heroes of Manly’s preliminary final defeat of Souths after scoring a crucial and miraculous second half try, cult figure David Williams turned in a lamentable performance in the grand final loss to the Roosters. The ‘Wolfman’ failed to contest a cross-field kick during the first half, allowing opposing winger Daniel Tupou to climb high and score the Roosters’ first try then, with the Sea Eagles up by 10 points during the second half, he inexplicably let another bomb bounce, forcing his side back for a line dropout which led to Aidan Guerra’s try. A dropped ball with a chance to score in the corner beckoning capped a horror night for the popular winger. The Dragons’ mercurial five-eighth Anthony Mundine singlehandedly thrust the joint venture into the ’99 decider with a mesmerising hat-trick in the preliminary final upset of Cronulla. But his trademark influence and spark was sorely missing in the grand final against Melbourne, while he bombed a certain try 10 minutes into the second half, losing the ball in the tackle of Storm winger Craig Smith as he reached out to plant it over the line. The botched effort would potentially have given the Saints a 20-2 lead. Mundine was powerless to stop the ensuing Melbourne comeback as the Dragons went down 20-18 courtesy of a late penalty try. Even putting aside his horrific golden-point fumble, there have been few more lamentable big-game performances by a halfback than Ben Hunt’s in what has been widely hailed as the greatest grand final of all time. 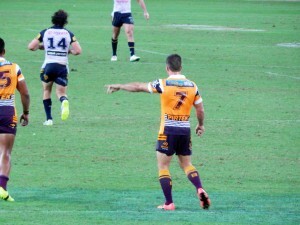 The gun No.7’s kicking game and option-taking was off, he copped a one-week suspension for an ugly spear tackle on Kane Linnett in the dying stages and he had the ball stripped off him with a minute to go to hand the Cowboys one last chance. The harrowing drop of the kick-off in extra-time – serving up Johnathan Thurston’s decisive field goal opportunity on a platter – was the icing on a nightmarish display. But the way the rugby league fraternity has rallied around Hunt shows the esteem in which the Broncos halfback is held – and he’s odds-on to make up for it with a Churchill Medal-winning effort of his own one day. It’s been said many times since, but the Broncos would not have been anywhere near ANZ Stadium in October had it not been for Hunt’s virtuoso efforts throughout 2015. St George captain-coach Graeme ‘Changa’ Langlands’ terrible performance in the record 38-0 Grand final loss to Easts was exacerbated by his decision to wear a conspicuous, now-infamous pair of white boots as part of a sponsorship deal. A misdirected painkilling injection on his injured groin removed all feeling from his right leg and consigned the future Immortal to the role of passenger, unable to finish off a gilt-edged scoring opportunity during a close-fought first half. Following his ill-fated decision to continue after halftime, legendary fullback Langlands could do little to halt the waves of Roosters attack as they ran in seven tries in the second stanza. For all of Easts’ brilliance, the ’75 decider will forever be known as ‘The Day of the White Boots’. Still plagued by the injury, the great ‘Changa’ retired early in 1976. Glenn Lazarus also had a shocker in 1999. He was just lucky they won. Got a feeling Ben Hunt won’t be remembered for the drop ball by the end of his career. Agreed Matthew. Great player. Unfortunately, he just had an off night.